Forest growth was 48 percent of mortality, while timber harvests were just 11 percent of what is dying annually. 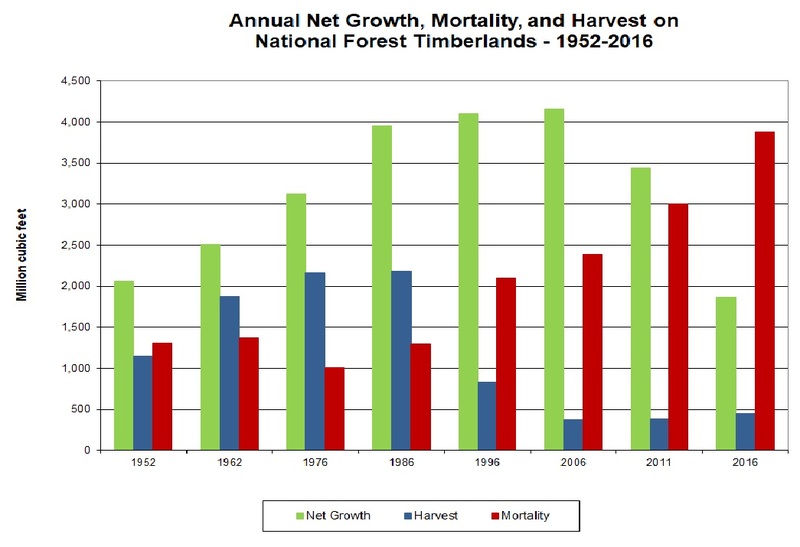 Forest mortality continues to trend upward. Last year the agency estimated there were 6.3 billion dead standing trees in just 11 Western states. What do these data mean? Far more trees are dying due to neglect – catastrophic wildfire, insects, and disease – than are being harvested and utilized as wood products. Our federal forests are not being actively managed, whether through logging, thinning and prescribed fire. As a result, our forests are dying at an astonishing rate. And today we have millions of acres with dense stands of trees that compete for light and water, making them more vulnerable to changing climate conditions, drought and insect infestations. Scientists have found that active forest management can ease overcrowding, promote tree growth, and help make our forests more resilient to disturbances such as wildfire, insects, and disease. The lack of forest management and resulting spike in mortality has limited our ability to capture carbon in wood products. Just one cubic meter of a wood product will store one ton of carbon monoxide. Forest management is a choice. We can continue to allow our forests to die and succumb to catastrophic wildfire, insects, and disease. Or, where can manage our forests to promote forest health, resiliency and carbon sequestration, while producing renewable and environmentally-friendly products that meet our daily needs and support thousands of American jobs. We choose active forest management. If you agree, tell your members of Congress to support forest management reforms.